This monster appears in the artwork of Excess Lesser Linker and Cynet Cascade. 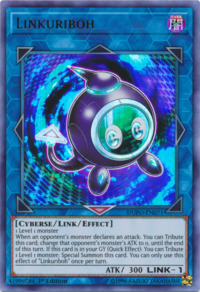 This card is one of two Kuriboh monsters whose Type is neither Fairy nor Fiend; the other one being Junkuriboh. It is also the first Extra Deck member of this archetype. This monster's single Link Arrow is at the end of its tail.